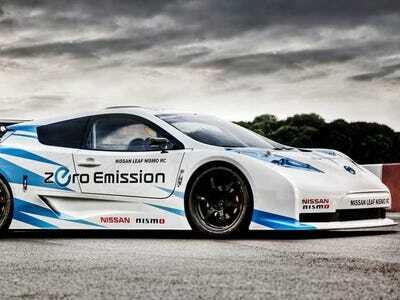 Nissan’s Le Mans project is led by NISMO, which built the electric LEAF NISMO RC. Every year, the organisers of the 24 Heures du Mans — the world’s most famous and prestigious endurance race — set aside a special garage for a car that pushes technological boundaries.Garage 56, as it’s known, has hosted some spectacular vehicles. This year will see a hydrogen vehicle occupy Garage 56, but for 2014 it’s Nissan’s turn–and the company’s entry could be a full electric vehicle. It’s not the first time Nissan has entered an unusual vehicle. Most prominent in recent years was 2012’s Nissan and Highcroft Racing DeltaWing. The Batmobile-like creation had half the power of a typical Le Mans Prototype but also half the weight–and was running strongly, using very little fuel and with hardly any tire wear, until an accident caused it to retire. But 2014’s entry could be even more groundbreaking. We can’t be sure it’s a full battery-electric vehicle — the company’s press release doesn’t state that exactly. However, with hybrid vehicles already fielded by Audi and Toyota, a plug-in vehicle is the next logical step for electric technology on the circuit. The project will be led by NISMO, the Nissan Motorsports arm which developed the LEAF RC race car concept. Following Ghosn’s announcement, Nissan is expected to reveal further details of the project in the near future.